'There is no greater sorrow on earth than the loss of one's native land...' a statement that is appropriate to the Tibetan freedom struggle for independence, a slogan that brought together the Tibetans, who had gathered at the Music Acdemy Mini Hall, recently, to participate in the Tibet Day celebrations. The one-day event was jointly organised by Friends of Tibet (INDIA), Tibetan Parliamentary and Policy Research Centre, TSAM and TRWA. The festival was inaugurated by the former commissioner of Police Walter Devaram, with the auspicious offering of the chamar (made of barley) and changu (wine). Then followed speeches by various people, including Ngodup Dorjee, the Dalai Lama's South India representative and Tsering Tsomo, the executive director of Tibetan Parliamentary and Policy Research Centre, New Delhi. Finally Claude Arpi, author of The Fate Of Tibet, threw light on the Indo-Tibetan relations during 1947-50. 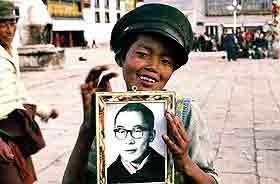 Titled 'Glimpses Of Tibet', the exhibition, mounted at the Vinyasa Gallery, comprising 27 black and white and colour photographs, captured the story of a nation whose cry for help is loud and clear. The strong links that exist between India and Tibet came through quite effectively in the photographs. The one in black and white where the Dalai Lama is inspecting the guard of honor in 1956, three years before he fled to India, is poignant. The ruins of the Ganden and Drepung monasteries, which were destroyed during the 'cultural revolution', tell another sad tale. The Potala Palace, Lhasa, the seat of the Government, bears a deserted look. And there is this moving visual of a little boy holding a photograph of the Dalai Lama. 'Please come back' seems to be the message for the Lama. 'Kundun', which was screened later, is a visual extravaganza that was shot extensively in Morocco. The film captures the life and the struggle of the present Dalai Lama, his emotional and spritual turmoil. Directed by Martin Scorsese, the haunting music score is by Philip Glass. That was most definitely the highpoint of the one-day festival.